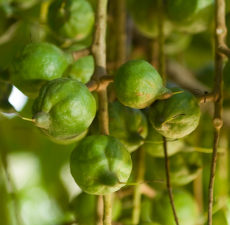 Organic Macadamia Nut Oil (Macadamia Integrifolia) - Sweetgrass&Rain Inc.
Macadamia Nut Oil is a wonderful regenerative oil. It is high in mono-unsaturated fatty acids, contains palmitoleic acid which has skins softening properties, as well as omega 3 and omega 6 fatty acids. It has been used in treatments to help scars and sunburns and is considered gentle enough for facial use.